Core Java has long been recognized as the leading, no-nonsense tutorial and reference for experienced programmers who want to write robust Java code for real-world applications. 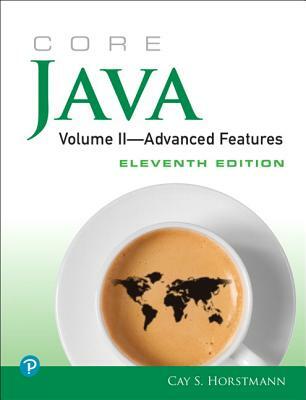 Now, Core Java, Volume II--Advanced Features, Eleventh Edition, has been updated for Java 11, with up-to-date coverage of advanced UI and enterprise programming, networking, security, and Java's powerful new module system. Cay S. Horstmann explores sophisticated new language and library features with the depth and completeness that readers expect from Core Java. He demonstrates how to use these features to build professional-quality applications, using thoroughly tested examples that reflect modern Java style and best practices, including modularization. Horstmann's examples are carefully crafted for easy understanding and maximum practical value, so you can consistently use them to jump-start your own code. See Core Java, Volume I--Fundamentals, Eleventh Edition (ISBN-13: 978-0-13-516630-7), for expert coverage of fundamental Java and UI programming, including objects, generics, collections, lambda expressions, Swing design, concurrency, and functional programming.